With a record of 6-6, the Miami Dolphins sorely needed to win in the snow in Pittsburgh in early December. Miami had jumped to a 17-7 lead, but the Steelers had rallied to go ahead on two occasions in the second half. With the Dolphins trailing 28-24, Miami used a 55-yard run from Daniel Thomas to reach Pittsburgh's red zone. Facing a 2nd-and-6, quarterback Ryan Tannehill found tight end Charles Clay in the flat. Clay threw off multiple Pittsburgh defenders including All-Pro safety Troy Polamalu on his way to the end zone. Clay's 12-yard score gave the Dolphins a 31-28 lead. Miami would avert disaster when Steelers' receiver Antonio Brown stepped out of bounds at the 13-yard-line on his way to the end zone on the final play of the game. In Miami's home opener of 2013, the Dolphins' defense bent, but refused to break throughout the day. The Dolphins had faced a pair of 10-point deficits, but got the ball back trailing by just three with under five minutes to play. Quarterback Ryan Tannehill led Miami on a methodical march and after receiver Brandon Gibson was stopped just shy of the goal line, the Dolphins faced a 2nd-and-goal from the Falcons' 1-yard-line. Rather than try to pound the ball in, Tannehill floated a pass to rookie tight end Dion Sim, who made a one-handed grab for his first career catch and touchdown. The pass capped a 13-play, 75-yard drive for Miami. Jimmy Wilson's interception of Matt Ryan on the ensuing possession ensured the victory as the Dolphins began the season 3-0 for the first time since 2002. As he had done the previous season, Indianapolis quarterback Andrew Luck was on the verge of leading a comeback against Miami. With the Dolphins clinging to a 24-20 lead, the Colts reached Miami's 34-yard-line. Luck was given plenty of time to throw on first down and went for the reliable Reggie Wayne in the end zone. Despite being at a height advantage, Dolphins' cornerback Brent Grimes out-leaped Wayne in the end zone and recorded his first interception as a Dolphin. The Colts would get one last chance, but Miami sealed the victory with Philip Wheeler's fourth down sack of Luck. It was fitting that the Dolphins were facing a team wearing orange and black on Halloween night, but scarier was the fact that Miami had let a 17-3 lead slip away and was on the verge of losing a fifth straight contest. After a successful late game drive by Tannehill set up a game-tying field goal from rookie kicker Caleb Sturgis, the Dolphins and Bengals went to overtime tied at 20. Miami and Cincinnati traded punts in the extra period, but after a solid Miami drive to flip field position, the Bengals were pinned deep in their own territory. After a pair of incomplete passes from his own 8-yard-line, Bengals' quarterback Andy Dalton was caught in the end zone on third down and sacked by Miami defensive end Cameron Wake. 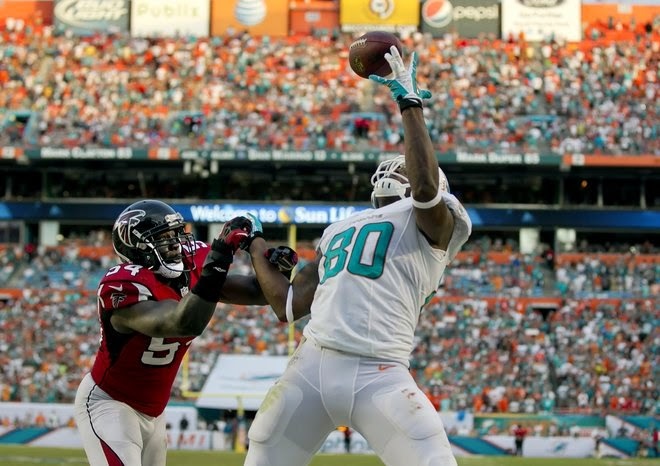 The play was ruled a safety and Miami became just the second team in NFL history to win in such a fashion. The New England Patriots brought a seven-game winning streak against the Dolphins into Sun Life Stadium in mid-December and looked to be on their way to #8 after grabbing an early 10-0 lead. Miami had rallied with 17 straight points, but it took a Tannehill touchdown pass to Marcus Thigpen with 1:15 to play to give the Dolphins the lead for good. As he had done so often during his illustrious NFL career, Tom Brady was leading New England on another clutch drive. New England had reached the Miami 14-yard-line, but after consecutive incomplete passes from Brady, the Patriots were down to one play. On fourth down, newly-signed defensive back Michael Thomas plucked a Brady pass out of the air to seal Miami's first victory over the Patriots in more than three years. Unfortunately, the Dolphins would drop their final two games, but Thomas' late-game interception clinched Miami's first non-losing season in five years.